What are the Characteristics and Symptoms of PMS? How has Femalite helped others? PMS is a condition characterized by a set of hormonal changes that trigger disruptive symptoms in some women prior to menstruation. Although exact statistics are not available, it is estimated that about 40 million women suffer from some discomfort or mood disruption just prior to their periods. PMS symptoms range from mild discomfort and moodiness lasting a day or two before menstruation to very severe, in some cases lasting up to two weeks. Often symptoms taper off with menstruation and women remain symptom-free until just before the next menstrual period. Over 150 symptoms have been attributed to PMS. There may be complaints of feeling "out-of-control", angry, irritable, anxious, depressed and having uncontrollable crying spells. Headaches and fatigue are also very common symptoms. There are often cravings for chocolate or carbohydrate rich foods. However, symptoms may vary from month to month and there may even be symptom-free months. Premenstrual emotional and physical changes occur in nearly 80% of menstruating women. The symptoms vary from woman to woman and from cycle to cycle. Their intensity ranges from mild to incapaciting. About 20% to 40% of women who have PMS experience symptoms that make life difficult and 2.5% to 5% experience PMS that is debilitating. Symptoms may be both physical and emotional. Physical symptoms may include headache, migraine, fluid retention (bloating), fatigue, constipation, painful joints, backache, abdominal cramping, heart palpitations and weight gain. Emotional and behavioural changes may include anxiety, depression, irritability, panic attacks, tension, lack of co-ordination, decreased work or social performance and altered libido. Scientists have been unable to identify a single cause of PMS. Theories range from hormonal and chemical to nutritional and psychological. Women whose mother or sisters have PMS are more likely to have it, so there may be a genetic component. A combination of genetic, physiological, and environmental causes are likely. PMS is a syndrome which is not well understood by conventional medicine and many women find themselves going from doctor to doctor in an effort to find help. Women often feel that they are not taken seriously and do not receive the help that they deserve. Sometimes doctors recommend prescription antidepressant drugs or anxiolytic medication. Over the counter painkillers and relaxants are also used for cramping. Fortunately, naturopaths and herbalists have a much more holistic understanding of the natural rhythms of a woman's body. Herbal remedies have been successfully used for centuries to help women with menstrual problems and to soothe the symptoms of PMS. Instead of trying to suppress symptoms, specially selected herbs and lifestyle changes are used to bring female hormones back to a natural balance - thereby restoring systemic health and functioning, without the harmful effects of psychiatric drugs or OTC medication. Femalite is formulated especially for women by a practising Clinical Psychologist. A therapeutic combination of herbs has been chosen to effectively treat and prevent all the major symptoms of Pre-menstrual Syndrome (PMS). Femalite contains concentrated medicinal extracts of three powerful herbs in therapeutic strength, to treat the most troublesome symptoms of PMS. 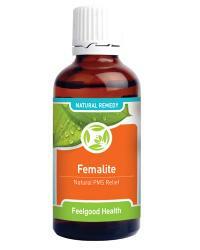 Use Femalite for a few days before your period and say goodbye to bloating, sore breasts and mean moodswings! Used for the first few days, Femalite is also very effective in treating and preventing menstrual cramps. Because of its gentle yet effective action, Femalite may be safely used by adults, teenagers and even pre-teens! "I had such bad pms - every month I cried and nothing seemed to go right for me. My boyfriend said I was like a different person. I don't think he could understand and we would have one fight after the other. Since taking femalite Ican feel the difference. Idont feel so moody and Ican talk about how Ifeel rather than yelling and crying. Thanks for all your help." "I have been to so many doctors and other medical professionals for help with my PMS. I was treated for depression and anxiety, given hormones, you name it. One doctor even recommended that I just have a hysterectomy and I am only 37 years old!!! I have taken Femalite and Don Quai together for only two months now. From my very first period I could feel the difference and this one was even better. For the first time I feel I have been helped and understood. Thanks to the Feelgood Health team for all their support and advice!" Foeniculum Vulgare, or Sweet Fennel, has been used for many centuries as a diuretic, anti-spasmodic and calmative herb. It contains an aniseed-flavored essential oil containing mostly anethole, as well as fenchone, both of which are thought to account for its anti-spasmodic and diuretic properties. Pulsatilla Vulgaris (Pasque Flower) is an important nerve relaxant and mild sedative, which is also a soothing tonic and analgesic for the female reproductive organs. Pulsatilla has also been used as a calmative by patients trying to recover from dependence on benzodiazepine tranquillizers. Melissa Officinalis (Lemon Balm) is indigenous to the Eastern Mediterranean region but is widespread throughout the world. It is often used as a general nervous system restorative, digestive calminative and to reduce blood pressure. Its active ingredients include volatile oil (including citronella), tannins, flavinoids, tocopherols and choline. Because of its concentrated medicinal strength and easy to absorb drop form, Femalite is quickly and easily absorbed straight into the blood stream for rapid relief. Age 9 – 12: 10 - 15 drops in a little water or juice three to four times per day. Begin use about 5 days before the onset of menstruation or when the first signs of PMS are noted. Improvement is usually apparent within about 5 - 15 minutes. Femalite can be used before menstruation begins and also for the first day or two of bleeding to prevent menstrual cramps and irritability. Femalite quickly helps to support a stable mood and balanced emotions within the first dose. With regular use, Femalite will support the brain, nervous system and reproductive system in the days preceding, during and immediately after the menstrual cycle. One bottle of Femalite will last through four to five menstrual cycles, depending on frequency of use. PMS can be treated in a variety of ways. The initial and usually most effective treatment involves non-medical changes in diet and lifestyle. Make sure that you take time to relax and 'chill', especially in the week before your period! Balance hormones and address nasty PMS too!